There are many of us, I’m sure, floating lonely on our rafts in a vast void of shame and disbelief that the very life we love causes harm to the oceans, to the fields, to the very air we depend. Desperately we seek to remove ourselves from a ‘tainted’ system and reconnect to beauty, to music, to a golden sunset, to birdsong. But the further out we float, isolated from the humanity we assume to be the cause of all this pain, and alone we drop anchor to face a future of disconnection. Weeping for home, for hearth or for any eyes in which we see ourselves reflected. We harden and close, preparing for the grim narratives that are about to begin. Untended grief can manifest in many ways and at this time of collective turmoil, we should be moving towards connection and never further away. Currently, there is a common cultural narrative that we are doomed. Life on this planet will be changed, landscapes will disappear and people will die. 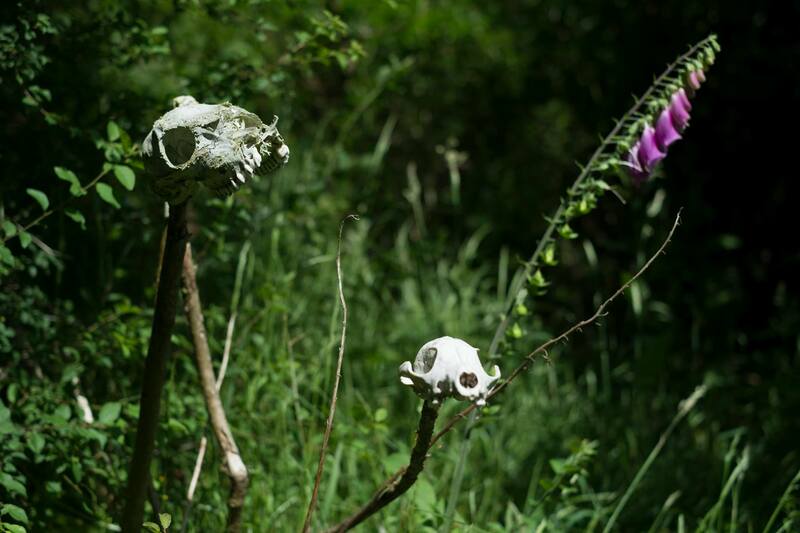 The scientific data points to a predicted extreme loss of habitat and species. Some people contest the causes and some people assume the planet will find a way of re-balancing. But the reports are clear that people and animals are already dying. And it is likely many many more will be displaced or wiped out in the not too distant future. According to the UN Environment Programme, scientists estimate that 150-200 species become extinct every 24 hours. This is nearly 1,000 times the “natural” or “background” rate. We are on the edge of the 6th mass extinction and the current rate of loss is 10 to 100 times higher than any of the previous mass extinctions in the history of Earth. My first response to this information is overwhelm at the enormity of this suffering. It feels too much to hold. The simplest thing would be to not hold it. I can rationalise this information by saying this is just how the planet evolves. I can compartmentalize the changing conditions we are in and say we as a species are just one drop in the ocean of time, and in whatever form, life will adapt. This is a useful response in remaining equanimous. I should not become attached to life or death but instead tune into the cyclical nature of existence. My personal journey through life is just one tiny strand in a great web. Remaining objective allows me to function. I am of no use to the world if I am paralysed by the fear and sadness of my own experience that only exists within a fraction on the scale of time. However, within me I feel a discomfort; a slight nihilism that this is the end and if so, so be it! ‘What’s the point’ is a strong question that keeps welling up inside me. I find my daily interactions with people lose a little of the gloss that til recently brought me joy. My experience of life seems to have gone grey. I am blocking something out and in doing so, protecting myself from the pain inherent with meaningful connection. By refusing to attend to the raw, and fragile experience, I am allowing the part of myself, motivated by humanity, to fade away. As I probe into this discomfort that sits within me, I feel I am standing on the edge of a great pool of sorrow, while hovering in denial that this pool is for me. This grief is so collective and global that it feels unlikely to be mine. The water is black and sticky and layered with the unwashable stains of shame, despair and fear. I am definitely afraid that if I go in I’ll never truly emerge. But it is probably time. And as I close my eyes and let go I am taken by a great wave of sorrow, stretching back hundreds of thousands of years to grandparents I have never met, and washing out far into the future to children I will never meet. I am grieving for the people dying, starving and homeless because their land is uninhabitable; ravaged by drought, rising sea levels and storms. I am grieving for the millions of people displaced through conflict, caused by ever decreasing resources, such as oil. I feel shame for our desire for industrial growth that has overshadowed meaningful connection with life and love and beauty. I feel despair and hopelessness that my children’s children will be fighting over depleting food and land. I feel fear and uncertainty for what the future will bring. Nothing changes by feeling it; it just means I am feeling. Grief makes us value connection, whether to an individual or to the planet and all its inhabitants. By turning towards grief I feel love for all species. By turning towards fear I appreciate that I truly believe life is good and worth protecting. I’m not suggesting I should put time aside to grieve for every butterfly that dies. Maybe I should?! But I acknowledge the strong emotional aspect of the cultural response to climate change. My grief reminds me I am a single entity within a great web and their suffering is my suffering, as their joy is my joy. Grief is a process towards accepting loss and change. What I held solid will not be the same. There will be death. There will be death of civilisation as we know it now. Everything that is dependent on fossil fuels will change. Culture will change. But the ending of something is not a bad thing. In a cyclical view of time, change is neverending. When one season ends, another begins. I can take this wisdom to stand back and accept the changing times and see what is already lost, but also, what can yet be changed to reduce impending suffering. This wisdom alone is not enough for me to act. Only through the compassion that arises by entering into the pain of grief do I feel motivated. When grief feels overwhelming, that is the time to allow others to hold it with us; collectively acknowledging our shared experiences. I am tired of feeling bad about climate change. I want to enjoy living and experience the myriad wonders that abound in this life. I want to celebrate my body as it moves and dances and connects with all beings at every moment. I want to rejoice in the sun on my face and water on my feet. The grief doesn’t stop, it pervades my every moment. But if anything, it enhances the clarity in which I process my experiences. My view of the world is no longer trying to block something out. By moving into grief I am moving further into connection with humanity and the non-human. And my life will now realign with this grief in a positive way. Change is happening, and I welcome it. Every year, in the cold of the winter, when the sap is down and the trees asleep, I go into the woods to cut hazel. 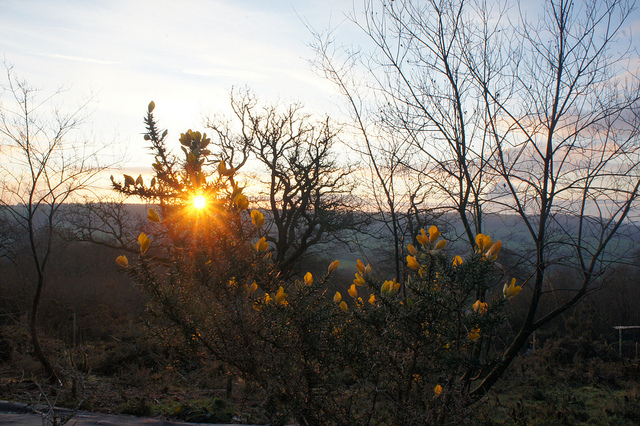 I hunt for the straight coppice poles that Buddhafield needs to keep our domes standing – cut while the trees are sleeping, so that in the spring new shoots will grow when the sap rises with the warmth of the sun. We now have one big 30 foot dome and eight 16 foot ‘standard’ domes. 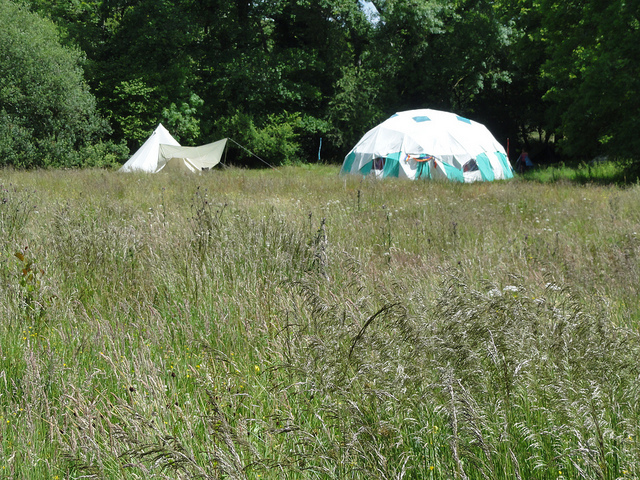 These provide the shrine space, sleeping and meeting spaces we need on retreat and for teams working at the festivals. It’s fair to say – that I love them all! So every winter the poles that make up these domes are pulled out of storage, unwrapped – and brought back to life for the year to come. Every year, within their wraps and ropes, hides a mixed mess of muddy, dusty poles, with snapped strings, broken ends, some just missing from their dome sets, the doors scattered and stray poles all mixed and confused. They have drawing pins, screws and random staples, twists of string and gaffer tape – they’re not happy domes. At present our domes have around 650 poles – and every one is checked over, the mud scraped off, staples, random tape and drawing pins removed. The broken poles, with snapped ends, pulled out for replacement, some re-used to replace missing short poles, some being replaced with freshly cut and stripped poles from the hazel harvest. Then I bring them to life – with heated linseed oil (mixed with turps, to aid penetration), strong gloves and a scrap of towel. As each pole is massaged with the oil – the dull and dusty poles start to gleam and shine again, so keeping them flexible and ready for the fields. Many poles are beautiful, their unique details and colour brought out by the oil. And every year they get a little darker. 650 poles… It’s long and sometimes tedious work you’d think. But it is not boring – as every pole is an individual with a story and history revealed by the oil. Within the stack of drying poles are remnants of the first domes, near 20 years ago – holes still there from the ring screws that used to be tied together to form their domes, large holes from when they were also tied together. These poles are dark with glowing lumps and bumps that gleam like old oak. They were cut from hedges and wild hazel bushes – and are twisted with many side branches, some still showing marks from files and billhooks. Among them also are two ‘broomstick’ domes, distinct, smooth poles, that pack tight. There are, here and there, still a few pine poles, roughly rounded once square cut shafts that, being pine, often break. There is another donated dome of startlingly thin, unstripped poles, fitted with plastic ends for wingnuts and bolts rather than the gas pipe rings of most of them. Then the domes built in our ‘mature’ years – mostly poles cut from trained coppice stumps, grown deep in the woods, smoothly stripped and trimmed with drawknives, showing fewer side branches, though still with many interesting kinks – or spirals from the eagerly hunted ‘honeysuckle twists’. I’ve said nothing of the canvas that covers these domes. That’s a story that Trevor and others could tell, from the days of using second-hand marque canvases to buying our first industrial sewing machine, to making our own dome and parthenon covers, then getting them tested and approved – but that is another tale. 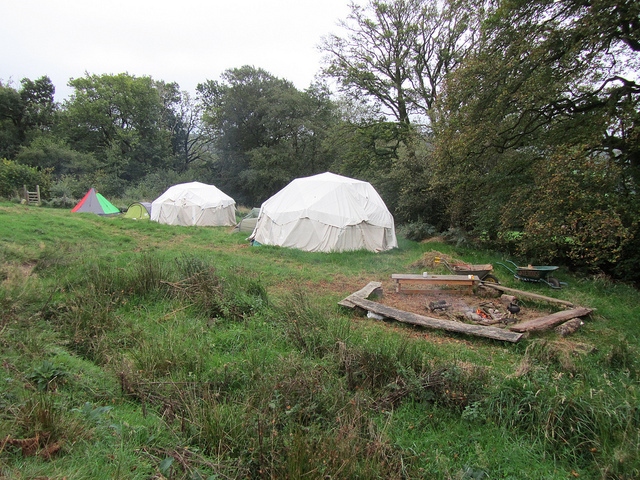 So now the domes are back at base, re-sorted into complete sets, showing the occasional brand new pole, all tightly wrapped and bagged, glowing and ready for the sun to return and Buddhafield’s life in the woods and fields to start afresh for another year. Sarah, our Buddhafield Administrator, tells us about her role and why she works for Buddhafield. How long have you worked for Buddhafield, and what do you do? I started working for Buddhafield just about 18 months ago, so am fairly new to the team. My role is one of general administration and office work, with a focus on front of house and publicity. So, if you email or Facebook Buddhafield then you’re likely to get a response from me! I really love this part of the work – being in touch with so many diverse people and helping them with their bookings and enquiries. It gives me an enormous sense of satisfaction. When I’m at the Festival I often wonder who these people are – I know so many names from so many email conversations, but rarely get to put faces to those names. I sometimes wonder if I should wear a t-shirt with ‘I’m Sarah from the Buddhafield emails’ on the back, just so I can meet all the people who I’ve been in touch with over the year! So if you see me in the field, do say hello. I also commission all the posters and flyers, which is a lovely part of the job and I get to work with really talented designers. I also work with a fantastic team of ‘Secret Agents’ who busily distribute our publicity material across the UK. I run our Facebook pages and our blog. Recently I’ve been working on a little slideshow video called ‘Nature Changes’ with artist Sophie Wake, which I really enjoyed – it was a chance to explore an element of Buddhafield through a slightly different approach to usual. Why do you work for Buddhafield? 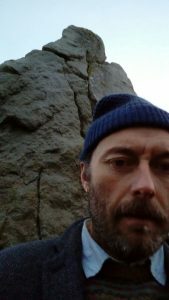 I work for Buddhafield because the Buddhist path has transformed my life, and I wanted to help other people to come into contact with it. Nature is the other big factor for me. I know that when I’m in nature, on the land, then everything feels ‘right’ for me. Even when it’s windy or rainy, there’s something about connection and joy and aliveness that I can’t deny. And so helping create this environment of simple, joyful community on the land, where people can connect with the teachings of the Buddha, is a precious thing. I feel deeply grateful to be able to work in this kind of context. What is it like to work in a team of Buddhists? The Buddhafield team have been really supportive of me, and that’s another thing I find about working here. It’s not like the corporate world of targets or performance drive, with the person themselves being overlooked. Though it’s busy, and there’s lots to do, there’s also a sense of deeper connection. The people I work with care about what’s going on for me, about my emotional and spiritual wellbeing. Often I’ll have a catch-up with someone, and we’ll begin with talking about our practice of meditation, or of ethics. We’ll talk about what we’re finding difficult in life and how we might be able to bring a more creative approach to that, moving beyond ourselves and into a more altruistic/open state of mind. 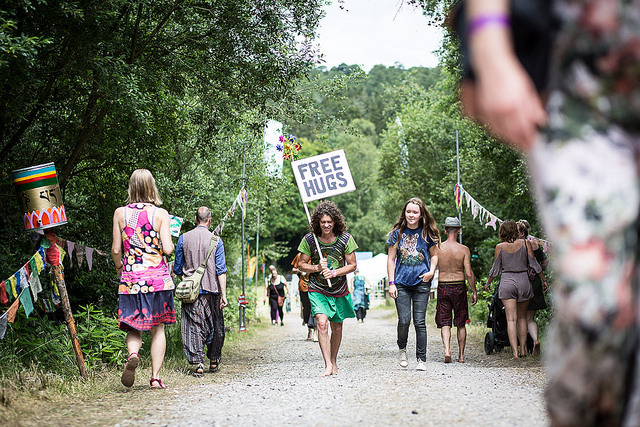 What Buddhafield events would you recommend? Ah, well all of them of course!!!! As publicity person I couldn’t really say otherwise! 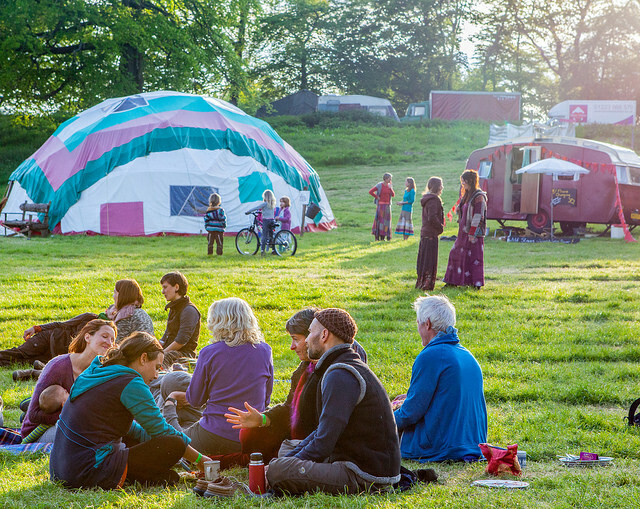 I think the Buddhafield Festival is such a joyful, crazy, creative explosion of loveliness, that everyone (Buddhist or otherwise) should try it at least once. But for me, last year a highlight was Green Earth Awakening Camp. It’s a much smaller and intimate event, and I loved the sense of community there. It seems to be a very precious space. I also think that the Satipatthana Retreat is a fantastic one this year – all about mindfulness, and how we practice it in our day-to-day lives. Being in a beautiful setting and learning to be more present with our experience, to open our hearts and minds to a larger perspective… what could be better than that? Simplicity sounds like one of those far away qualities. It’s something I see in the distance, just out of reach. It’s spacious, pure, light and loose and it is something I want. If I am to move towards it surely I must rid myself of these hindering complexities I have heaped up around me. Surely I can’t find simplicity here; amongst the chaos and clutter of my life. I have a toddler and a newborn and my world is a complex negotiation around nappies, washing, easter bonnets, packed lunches, tears, and hunting for that particular lego man because another lego man just won’t do. Somewhere within this I go for refuge. The Buddha talked of renunciation being the optimum means by which to move forwards into bliss. Attachment to possessions and the people around us can keep us entrenched in our rigid views of ourselves. Renunciate – go forth, leave the burden behind. I seem to be doing less renunciation and more accumulation of dependent people around me. How do I move forward into renunciation while I have been moving steadily forward into the midst of this family life? I am deepening myself into attachment and routine with little time for retreats, solitude and a regular meditation slot. Plus I am accruing the associated posessions of house, car, car seat, fridge, stuff to put in fridge and so on and so on. I have been pursuing the spiritual journey, attempting to carve a pathway to liberation that is currently meandering around family life. But I come to realise there is no solo voyage of personal liberation. There is no linear trajectory that takes me away from the life I have already established and the people within it. I can give up my physical cupboards of clutter yes, but there is a deeper question. How do I find simplicity here? I can’t step outside these conditions to find it. This is life and it is only when I let go to that does the very simple nature of reality appear. I am not looking for simplicity. I am embracing what is already here; the simplicity of the true nature of how things are. When I look at my children I see the deeply rooted bonds we have forged. I love them beyond measure. But if I strip away the labels and attachment of what we are to each other, I can see more clearly he is a being and I am a being and we have love for each other. As a being in the world, he will suffer. That is a part of living and I cannot stop his suffering. I cannot stop his dying. He will die and I will die. But what he is now is life; full of potential and feeling and connection with the world. And all I need do is just live and love with him. I cannot control anything else. Bodhichitta arises in dependence of others. My spiritual practice must exist because of, not despite my chosen, chaotic life and the people I serve within it. The wheel of the dharma did not start to turn until the Buddha began teaching, so it could be said the Buddha became known as Buddha only in dependence of others; through others the teachings emerge. 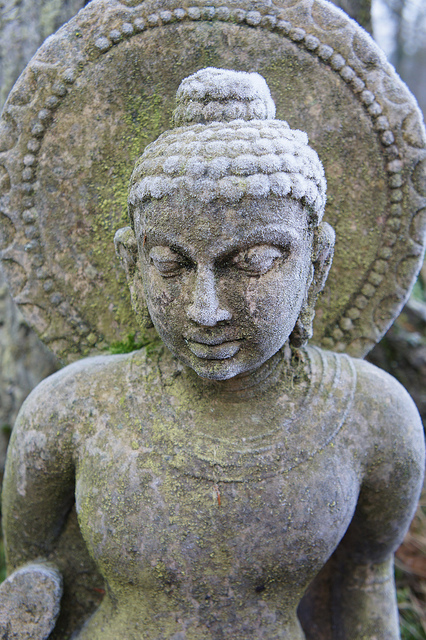 The story of Buddha’s friend Ananda, I find motivating in this context. He dedicated himself to service of the Buddha’s needs and because of this some say he did not progress as quickly as other disciples in gaining credited levels of insight. However, he reliably absorbed the teachings and when the buddha died, Ananda did achieve stream- entry. Perhaps it could be said that during the buddha’s life Ananda’s focus was on service as opposed to an individually led road of practice. Our realisation of the interconnection of all life means there is no individual striving for liberation as there is no liberation separate from others. For Ananda service was one way into this insight. The crisp clarity of simplicity is aready here within us if we can only recognise it is the same for every single being around us too. When I embrace this realisation life seems so much simpler. That spaciousness I thought was somewhere else, or at least only present when I sat alone, that boundless spaciousness is right here. And I don’t have to find it, I just have to let go into it. Like falling back gently into white cloud. Within the needs of my family, my work, the washing, the cooking, the gardening and the endless tidying is space and calm at every moment. Because all I do is for the benefit of others and thus for the benefit of myself for there is nothing else to do but just love and be. My awakening is not a single-pointed goal, it is an unfolding into the constrictions and muddiness that is right here. Within the chaos is the clarity of reality and the acceptance that nothing can be controlled. We’re pleased to announce that this year’s workshops line-up is now available! This year’s delights include Ecstatic Dance with Jewels Wingfield, Rainforest Singing with Su Hart from Baka Beyond, Shamanic Sound Healing with Paul Vermette, Emotional Intelligence for Parents and Children with Karen Pike, Haiku Poetry With Matti Spence and tons more. Check out our website for more details. Our Word Up! Spoken word pace also now has line-up information. Come and give your ears, heart and mind a treat! 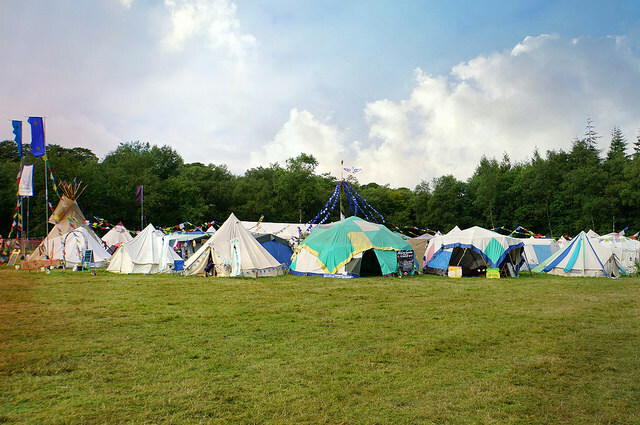 The Buddhafield Festival takes place from 12th to 16th July in the Blackdown Hills. Get your mitts on some of our lovely tickets! 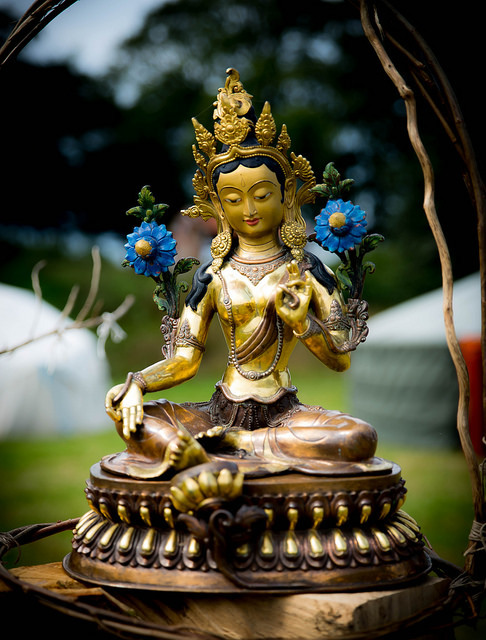 Come and join us on the Buddhafield Women’s retreat, which runs from 9th to 16th June. 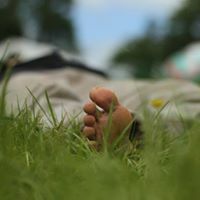 Our theme is ‘A Deeper Joy’ – exploring this aspect of Buddhist practice, through mindfulness, connecting with nature and our bodies, and singing. Optional yoga. 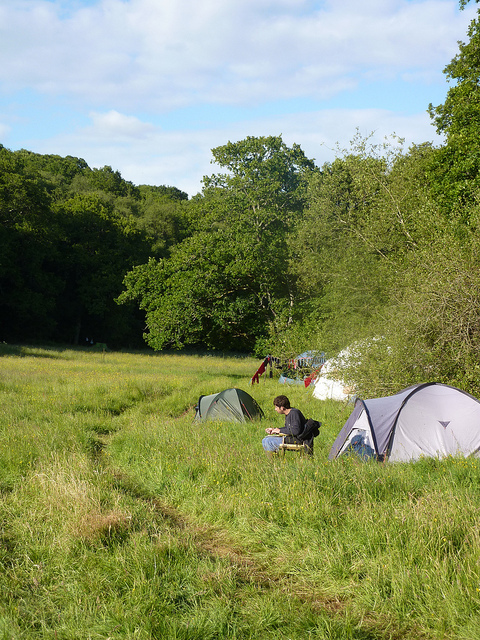 Great organic food, a beautiful Devon site with owls, in a secluded, quiet valley with woodland and streams, and great company! Led by: Ambaravajri and Dayajoti. 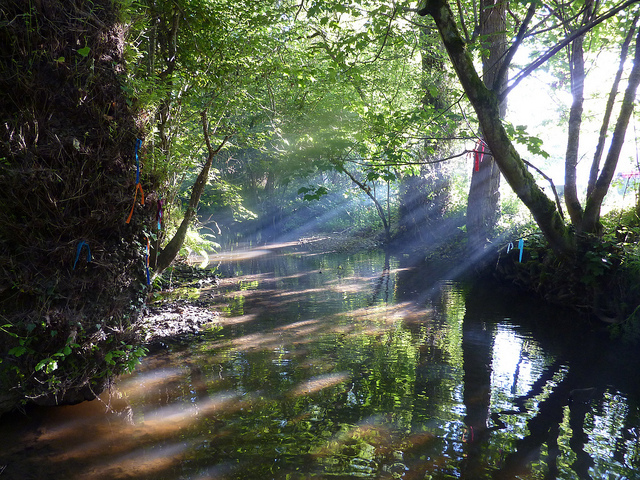 Boarded by the stream and the ancient Nymet woods, Easterbrook meadow is an ideal setting to explore the Buddha’s teaching on mindfulness based on the Satipatthana and Anapanasati suttas. The team bring a depth of practice and experience to facilitate an opening to depth and magic through meditation, ritual, reflection and stillness. Led by: Manjuvajra, Amaragita and Jayaraja. Feel free to sign up to receive our email newsletter, or our annual brochure of events in the post! We can keep you in touch with what we’re up to in various fields across the land! Claims of an ‘indigenous Britain’ have been recently hijacked as nationalist slogans by far right campaigners. It can be argued that any idea of a people native to Britain is obsolete, and in current cultural terms; racist. But if we put aside the idea of indigenous as a purely ‘native’ or isolated community then we can use the term to describe a people living in response to their past and in respect to their future. We can start to explore how an indigenous world view could open up into a global, collective vision for our future. What can be learnt from an indigenous world view? Their stance is a holistic and interconnected understanding of resources and collective impact. All aspects of the environment are considered equal to humans as conscious beings. They believe the world is inherited from our ancestors and what we leave behind affects the next generations. Long term thinking of ‘future ancestors’ is a vital part in recognising our role and responsibility within a massive complex system of life. Current living standards in the west allow many to benefit from a comfort and ease far removed from a survivalist existence. There has developed a disassociation with the resources and labour required in the meeting of day to day living needs. Resources are therefore depleting and we begin to spiral into blind desire for the status quo while taking more than is sustainable and abusing a cheap human labour force. Fear is growing as to what the future may look like if current resource consumption is not halted. Younger generations growing up with the looming shadow of climate chaos are experiencing resentment for not only their uncertain inheritance but also their perceived ‘identity’ as a destructive species. Many feel a desperation and hopelessness in the face of so much uncertainty. How does a disillusioned generation empower themselves for the benefit of future world inheritors? […] fading existential pressures [i.e., threats and challenges to survival] open people’s minds, making them prioritize freedom over security, autonomy over authority, diversity over uniformity, and creativity over discipline. By the same token, persistent existential pressures keep people’s minds closed, in which case they emphasize the opposite priorities…the existentially relieved state of mind is the source of tolerance and solidarity beyond one’s in-group; the existentially stressed state of mind is the source of discrimination and hostility against out-groups. We currently live in a culture of global horizons; influenced by ideas and products from every corner of the world. This diverse multiculture creates the potential for a harmonious, holistic world view. Ironically globalism can instill an individualist mentality that builds separation between cultures and even the natural environment. How do we hold a collective idealism that incorporates all of the human and non human world? In light of Britain’s EU referendum and America’s Trump, there is a current political trend towards an anti-globalisation and a defence of national identities. There is a desire to move away from global individualism and focus on the local. What separates Trump’s brand of national identity from, for example, the Standing Rock Sioux in their defence of Native American Land against oil development; is an awareness that the nature they defend is inseparable from their cultural heritage. For Trump, it could be assumed that based on recent decisions made in his environmental policy, nature is an obstacle to bypass. 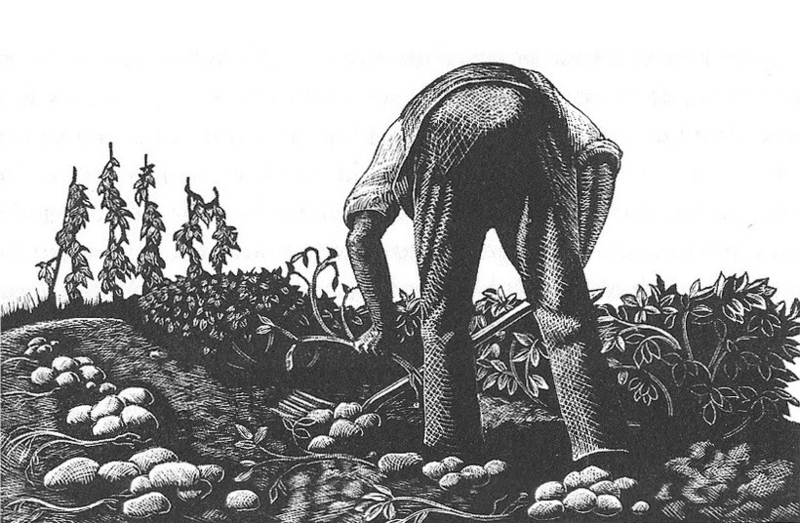 We may be beyond the point of distinguishing ancestoral lineage within our current diverse culture, but we can recognise the history of a place and the journey of the people that have populated it.The folklore and traditions that have come before us may tell us vital information about how to interact holistically with our landscape. This awareness of ancestors, whether of blood or not, globally or locally, create a narrative that will continue through future generations. This sense of identity gives purpose and responsibility for the stories we leave behind. If we are to move collectively towards a more harmonious interaction with our natural resources, we have plenty to learn from the methods of indigenous cultures. The current political move towards anti -globalisation is playing out the desires for tribal community. However, we must be careful in harnessing these desires in relationship to the wider context of our ecological heritage. Without a connection to the human and non human world, we are in danger of being consumerist individualists masquerading as global community members. We cannot understand the true sense of interconnection without recognising ourselves as part of, not adjacent to the natural world. The journey towards this understanding must incorporate all aspects of what we are and from where we have come. For me, simplicity is about making space to fully encounter the richness of life. To be able to be open to my experience, each day, with a sense of curiosity and wonder. I want to live life with purpose and intention, rather than letting time go by with no real sense of where I’m going or what I want to do. If life is too crowded or overly complex, it’s difficult not to be overwhelmed and to keep this sense of openness and purpose. As a Buddhist, I want to deliberately cultivate certain qualities or states of mind, such as patience, kindness and compassion. I want to be able to deal with whatever comes my way with as much grace as I can muster. The Buddha talks about the ‘eight worldy winds’ that blow – gain and loss, fame and infamy, praise and blame, pleasure and pain – and how to keep a sense of equanimity, as these blow us around. Having a simple life creates more space to be able to focus on these positive qualities and keeping balance through the ups and downs of life. Schedule – What am I committed to? This might include events, chores, jobs I’ve signed up for, responsibilities with work, volunteering, school. Do I really want to do each of these things – does it align with my purpose, my plans and my sense of joy? Can I let go of some commitments? I try to use honest and kind communication to say no to people, where I need to, and schedule in time doing nothing or relaxing with family and friends. I want to make time for the important things, including meditation, silence, stillness and being out in nature. Possessions – Am I surrounded with stuff?! It’s amazing the negative mental impact of too much stuff – or ‘stuffocation’ as it’s been famously called. Decluttering your home environment can bring a huge sense of peace. The less things we own, the less time we spend organising, cleaning and maintaining them. I consider what I really need, or what is beautiful to me. I found it very interesting to count how many things I have – how many mugs, how many pairs of socks, how many CDs. It’s as though I had no real knowledge of the things I owned! I want to come into relationship with my possessions, for which I have worked hard to earn money for. I also counted my clothes (which was a real eye opener) then spent time thinking about what clothes I really enjoyed wearing. I wanted to reduce my things to see what happens when space opens up in my home and I have a sense of really treasuring the things that I own. 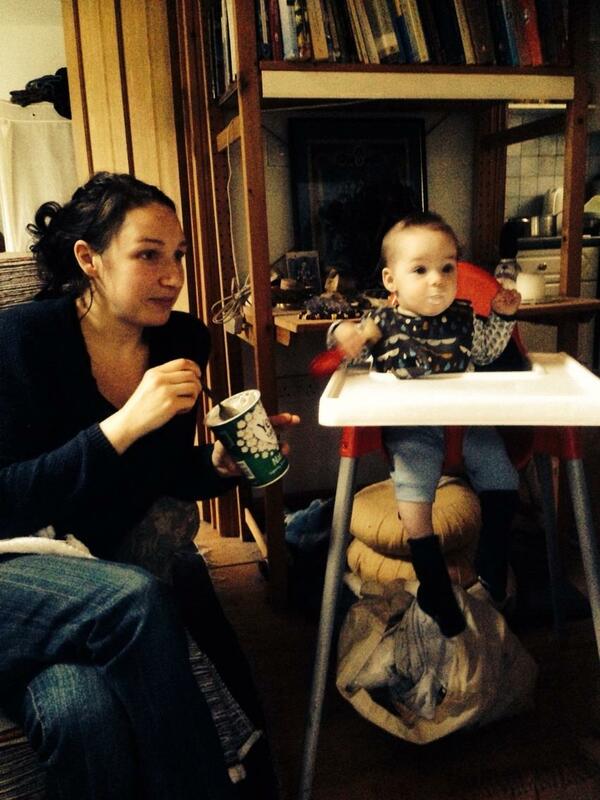 Parenting – Can I parent in a simpler way? Is my child over-scheduled? I want to make sure that my child has downtime, and can get bored, which then leads to a greater sense of creativity. I also try to be mindful about the numbers of toys around, so that my son doesn’t get overwhelmed with choice. It’s not always easy to do this, so it’s a practice keeping mindful in this area. Can I also simplify my sense of control with my child? Parenting with ‘benign neglect’ gives children greater freedom to learn by themselves and makes life much simpler for the parent. I try to notice when I’m being overly controlling and can lessen my hold a little. Finance – We’re encouraged to buy lots of stuff, and with this comes a level of financial complexity. I try to check in on my finances every day and adjust when I need to. I make sure that I know exactly what’s coming out of my account and why. Am I making good choices about what to buy and what to pay for? Are these in line with my values? Am I spending money to fill a hole, and if so, can I really sit with whatever emotion is underneath that (such as fear, anxiety, boredom) rather than throwing money at it. Can I simplify my financial commitments? Do I really need all the things I’m paying for? Money is easier to manage if we stay mindful to where it’s going and reduce the number of outgoings we have. So you may wish to begin considering one of these areas in your life. Take some time to sit with a cup of tea, and think honestly about your own choices and intentions. What do you really want for yourself and how might you be able to simplify? The point of thinking practically in this way, is to remind us to come back to what’s important, to the reality of life. The Four Reminders are traditional Buddhist reflections which help us to remember deep truths about our human existence. This life is both short and very precious, a beautiful gift to be used well. We cannot avoid sickness, old age and death, and we don’t know how much time we have. Whatever we choose to do with our lives – from the small day-to-day actions to much bigger choices we make – this has an impact on ourselves, others and our environment. So we need to make wise choices, and focus on that which really matters. Simplifying our lives makes space so we can live intentionally, cultivate positive emotions and connect more deeply with others. Even as it comes into being. 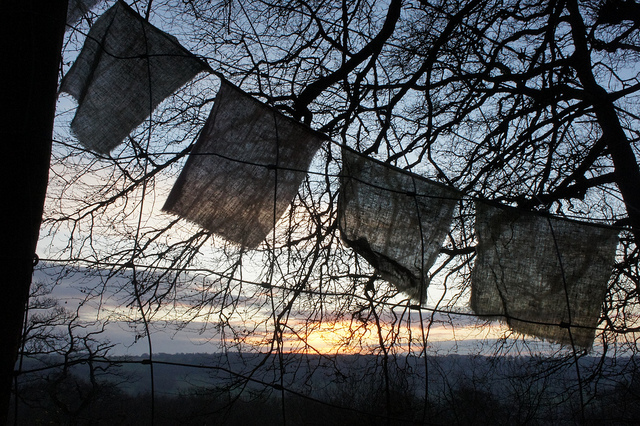 Buddhafield Retreats are one way to simplify and create space in life to reflect and to pause. Our 2017 Retreats Programme is open for booking! Buddhafield’s Danaraja explores what our 2017 theme ‘Embracing Simplicity’ means for him, as a practising Buddhist. I find it useful to view simplicity on three levels. Firstly there is external simplicity. This involves removing from one’s life anything that may hinder one’s ability to engage in Dharma practice. Obvious examples would be hunting animals or selling arms. Other examples might be simply giving some activities up so that we have more time for meditation and reflection, more space to open the heart to what is. Secondly there is the internal aspect. To be able to give up craving and aversion would dramatically reduce mental fabrication, leading to a refreshingly simple way of being with our experience. Imagine having no mental proliferation! We are told that our experience would be infused with generosity and the joy of selflessness. Thirdly we can approach simplicity from the standpoint of wisdom. Through practicing the Dharma we can have a life free from the entanglements of confusion and ignorance, a life dedicated to the liberation of all beings. One way to approach these three aspects, to embrace simplicity, is to serve. This is training in the compassionate side of wisdom, the altruistic aspect of enlightenment. At Buddhafield we try to set up conditions for people to practice the Dharma and free themselves from the torments of greed, hatred and delusion. We dedicate our lives to this. This means we must live simply, frugally even, and yet with this simplicity, with this apparent ‘giving up’ what is left is a sense of abundance and joy. 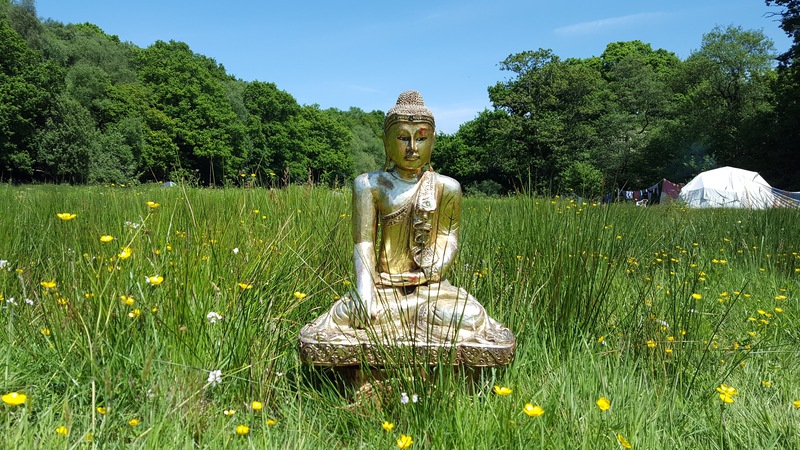 The simplicity embraced at Buddhafield is very rich, involving service to the Three Jewels, community living, right livelihood, regular meditation and devotion, friendship and the invitation for the world to hear the Buddha’s teaching that points to liberation. Dana or generosity is the aspect of practice found within the Buddha’s teaching that, I think, best encapsulates this idea of service and at the same time leads us through the three stages of simplicity I’ve outlined above. Dana is a practice that is prone to underestimation, however it is present throughout the Buddhist tradition and exists on many levels. Firstly we can develop the spirit of open-handedness through practicing the second precept “With open-handed generosity I purify my body”. Dana is also the first perfection of the Paramitas (Perfections of Wisdom), setting up conditions for ethics, patience, energy, concentration and wisdom to emerge. This is the practice of a Bodhisattva, where generosity is conjoined with wisdom. It is also one of the four Sangharavastus, which are concerned with the creation, development and strengthening of the spiritual community. Through these Dana practices we embrace simplicity by giving up unskillfulness which causes us suffering and distress, complicating our lives and we move towards wisdom, while also benefiting others. So Dana is about non-attachment to I, me, mine. With true generosity there is no sense of gift, giver or recipient. It is where wisdom and compassion fuse into one path. Dana it could be said is both a cause and a fruit of embracing simplicity, it is the open road to wisdom and compassion, it is the awakening of the heart. The Triratna Community at its best is not just on this path but is this path. If we take care of our personal practice through embracing a simpler lifestyle and allowing space for the truth of the Dharma to flower and giving up craving and ignorance; and our collective practice of serving the Dharma, we can offer an alternative perspective to people. The world is burning with greed and hatred, fueled by fear and ignorance. People need, we all need, confidence in a perspective that comes from generosity, love and wisdom. We can each contribute to this revolution. By embracing and living the great renunciant’s teachings we can offer a perspective revolutionised by wisdom and compassion for all beings. Our forthcoming Broadhembury work week takes place between 19th and 25th February 2017, and is open to all to come help for a week, a day or somewhere in between! Ruth Phillipson tells us about her experiences of working at Buddhafield’s Broadhembury site. This last weekend I helped hold a work weekend at Broadhembury. Buddhafield owns this site, 28ish acres of woodland, on the side of a hill in the Blackdown Hills. It is a beautiful mythic site, but is also known to be quite a hard site. It’s down a muddy bumpy track, and kit must be wheelbarrowed over a bridge, and even got up a hill, to be set up. It’s worth the work though: it’s wet deciduous woodland, with secret paths and hidden epic trees. To get to the shrine tent you have to climb a hill and then walk along a track under mighty beeches, and past bright gorse, until you reach a clearing, with a great beech, nicknamed grandmother beech. Underneath its branches the big geodesic dome is set up. Years of practice has accumulated in that clearing and many rituals have taken place grouped round the big beech. When I arrived there last weekend and climbed the hill to greet her, I felt like I was greeting an old friend. 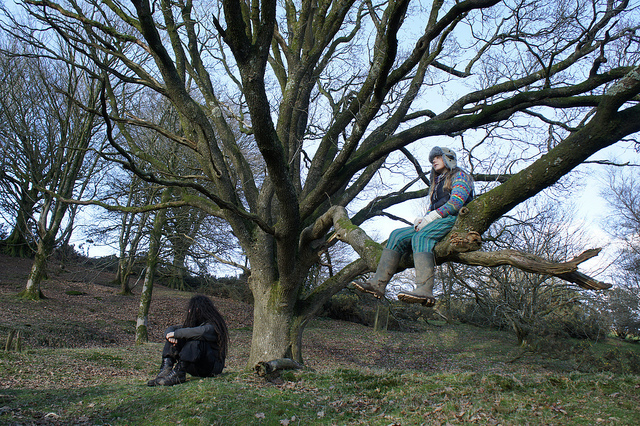 Retreatants have lain along her limbs, whispered confessions and secrets into her mossy skin, and left offerings in the fork of her main branches. Though it is a site that takes a lot of work to set up, it also gets under your skin: you fall in love with it, with the trees, and the mud, and the ever rushing of water always playing along in the background. One day you can live life in a literal cloud, and then the next bask in bright sunshine. On the work weekend we experienced both! The epic mission started on Friday morning, when Beth and I met at the Buddhafield community just outside Crediton, and drove to the few different places Buddhafield uses for storage. We filled her van with a dome, first aid kit, blankets, cushions, flooring and myriads of useful bits and pieces that weren’t on either of our lists, and set off down the A30. Already it felt like a mythic journey! 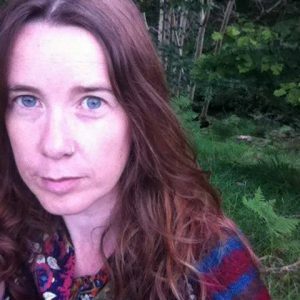 I left Buddhafield a couple of years ago and went to live in Scotland at Dhanakosa, this event would be the first one I had done since then, and it felt really good to be working in a group, with another woman. 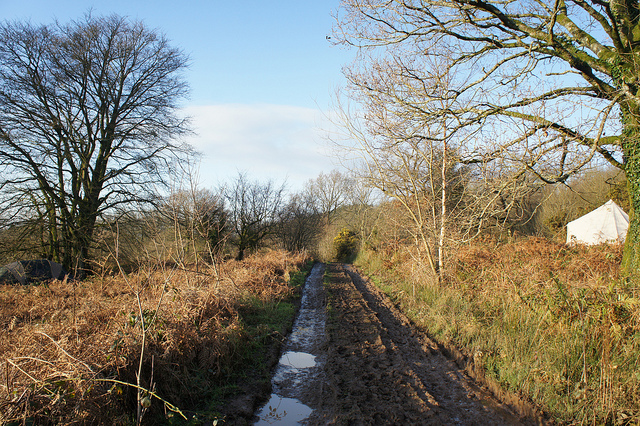 We stopped in Honiton for food shopping and a few last bits and pieces, and then braved the bumpy track. It was a bit hairy, but we got up to the hard standing, a concreted place, which we have traditionally used for live-in vehicles. We were greeted by a building site. Satyajit has been at Broadhembury for a couple of weeks already, using a mini digger and dump truck to create a flat terrace which we can use for a car park, and also to dig out ditches beside the track, and do some base work on the track itself. The plan is to put stone along most of the track to make it usable for cars to get up, we arrived right in the middle of that, before the stone, but after the digging out, so it was pretty muddy! This is the view from the hardstanding, with Satyajit’s big blue van on the left, and a track heading into what will be the car park in the middle. Beth and I left Satyajit to his digger, and carried onto the field next to the hard standing. 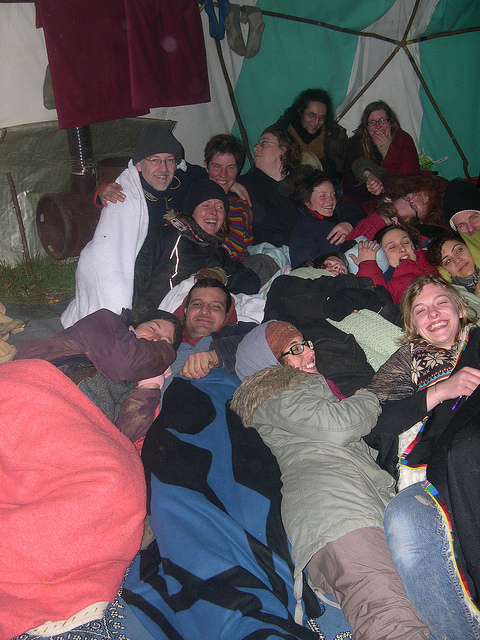 We put up a shrine/sleeping dome and, just as we finished it, more people arrived: other community members, a friend of theirs and later on another ex-Buddhafielder, Leif. We had dinner together in Satyajit’s bus, which was to be our main base for eating, cooking, and generally hanging out, and did a dedication ceremony, heading to bed excited about the weekend, about working together, and about making this bit of land easier to access. 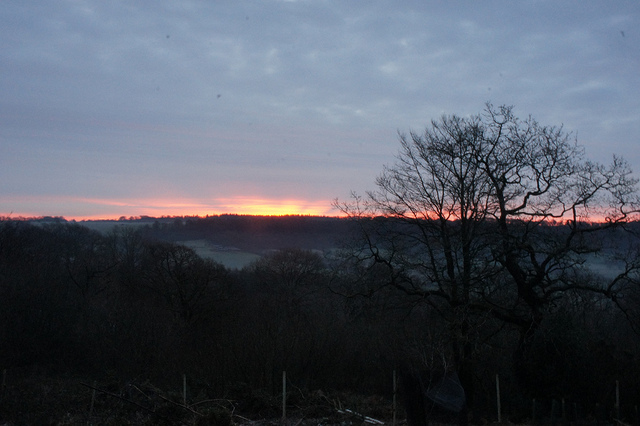 We woke to a beautiful clear sunrise, pink edging along the horizon, and a cold chill to the air. It was so quiet, apart from the sound of water. We gathered sleepily in the shrine to start our day, and after breakfast and a check-in, Satyajit took us on a walk around the land. It was so good to see the extent of our land, to see little bits that I hadn’t seen before, and to hear some of the history behind what has been done to different parts. There have been many plans for Broadhembury: from growing vegetables and willow to having a forest garden. Currently, the main focus is to make it easy to hold a retreat there, easy for people to access this wonderous corner of the world. The rest of that day, and also Sunday, was spent focusing on the track. Undergrowth grows thickly along the sides of the track, brambles, and honeysuckle, rhododendron and hazel, all grow along the fence on one side and the ditch bank on the other. The ditch is sometimes almost covered over with years worth of fallen branches and leaves. Our aim was to clear away some of this, making the track more passable. Saturday afternoon was an experience of Broadhembury at its best. The sun shone brightly, and we all stripped layers off and turned towards the light, enjoying the heat. We slowly worked our way up the track, digging out bramble roots with cries of satisfaction, snipping back honeysuckle and gathering all the cuttings into the van to be burnt. As it grew dim we headed back to the van, for dinner, and then a puja. Later that night it started to rain. And it rained, and rained, and rained. Sunday was a day of wet work, of eating biscuits endlessly, and wet clothes and raincoats hanging everywhere in the van, of getting covered in mud and smiling, and of leaning into just letting the elements be. Here is where practice comes. It is so easy to smile and be generous and happy when the sun is out, but when it starts raining, and there is still work to be done, and your feet are wet, and there are 7 of you squeezed into a small van, that is where practice starts, and continues. I definitely had a few momentary meltdowns, but generally, I think being in a group, working closely together helped us cope with the rain. We were able to find joy and laughter in what we were doing. On Monday morning we gathered ourselves, wet trousers and jumpers, tents and blankets and, after the transference of merit, we all headed off to our homes, and onto other adventures. The ground has been prepared for the next work retreat (19th to 25th February 2017) when we will be working on the hearth area. Could you meditate for a month? 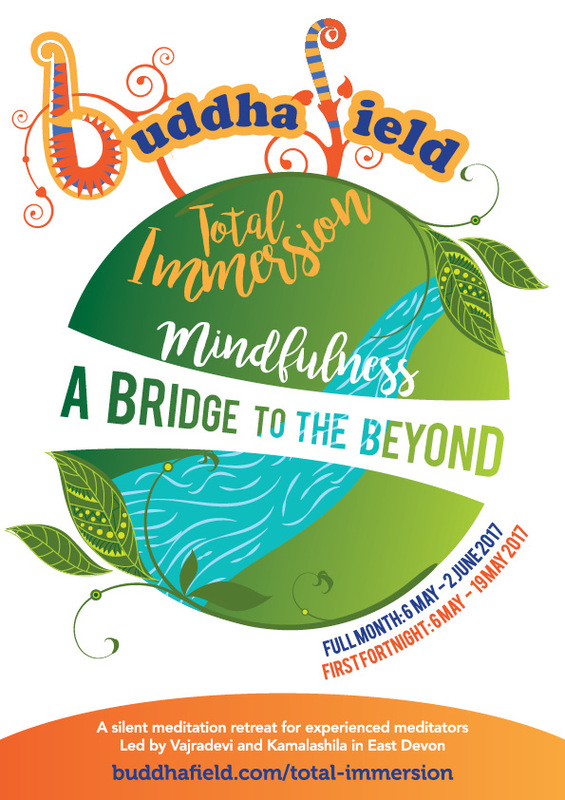 Every year, Buddhafield holds the Total Immersion retreat, a month of silent meditation in nature, with the option to stay for only two weeks. It’s one of the most beloved events on the calendar. 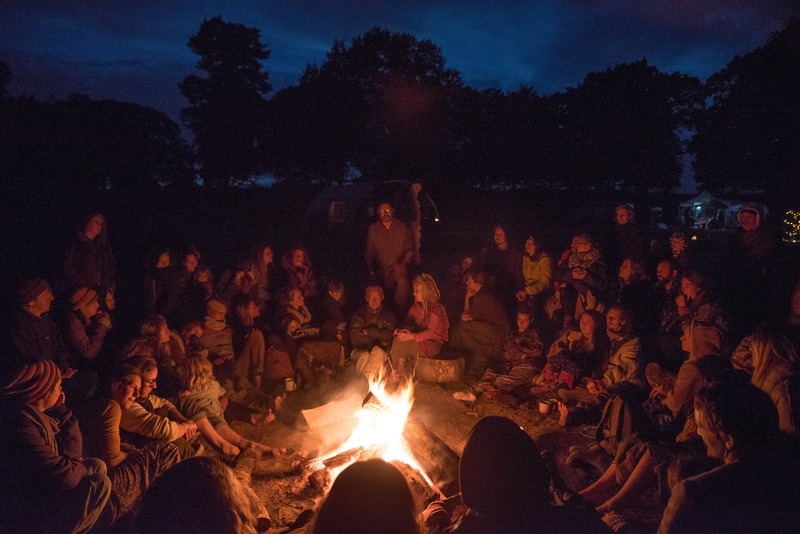 There is meditation teaching, ritual, silence and wood-fired hot tubs, and everything takes place under canvas or the open sky. For most people, the idea of sitting quietly in a lush meadow as birds chirrup in the trees, is a pleasant one. Something you could easily spend a day doing, but the notion of doing that for a month, in silence, can be daunting. The silence at Total Immersion is deep, but not cold or restrictive, there are other ways to communicate and the wonder which unfolds as your vocal chords, and then your mind, quiet down can be astonishing. Thoughts become clearer; things and people often become more beautiful; you may notice sounds you wouldn’t have, like the timbre of a stream as it chuckles over rocks. The silence can become a quiet contentment and warm appreciation that you share openly with others. It is true that, given some space, the emotions we prefer to avoid will probably take their chance and emerge but this doesn’t have to be a horrible experience. 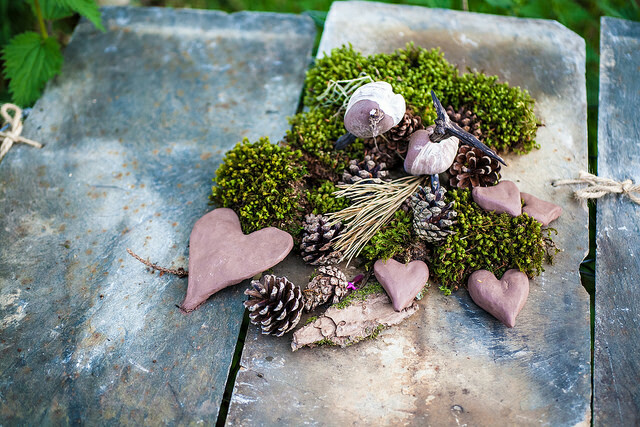 The team are highly experienced in creating supportive, joyful events with real spiritual depth and many people find being in nature to be instinctively supportive; for our bodies it can feel like coming home. This, along with the positive, welcoming atmosphere, helps create a safe place for any pain or sadness to arise, without being too overwhelming. It often flips and can be greatly freeing, growing into an expansive feeling of love. 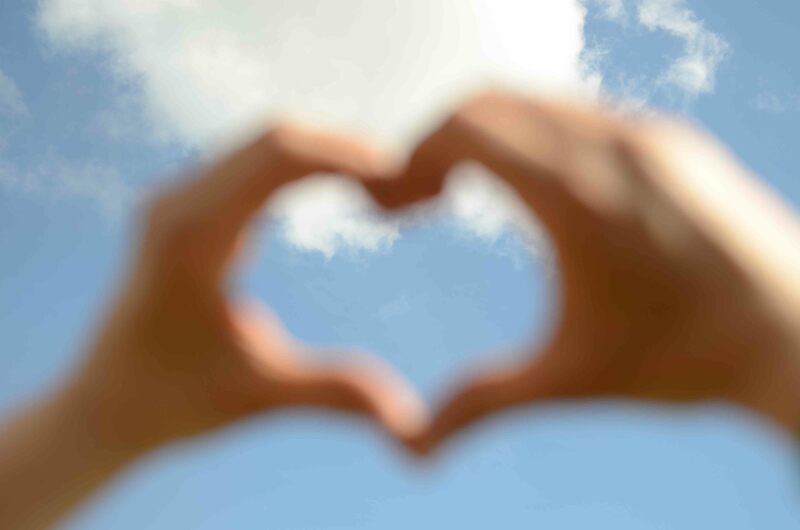 There are also regular meditation reviews which offer guidance, support and more personalised teaching. This year, the theme of the retreat is Mindfulness: Bridge to the Beyond, based around one of the Buddha’s primary teachings on the subject, the Satipatthana Sutta. Both meditation teachers have decades of experience on the subject. Vajradevi has been meditating for 31 years, and studying this particular teaching for 15 years – much of her practice is based around cultivating mindfulness. Kamalashila has been teaching meditation for over 40 years and led the very first Buddhafield Total Immersion retreat 10 years ago. 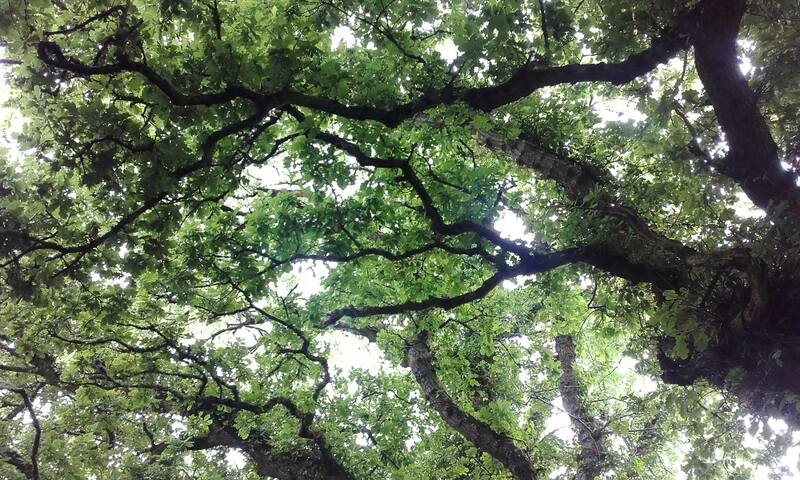 Mindfulness may appear simple but has incredible richness, particularly when practising in nature. 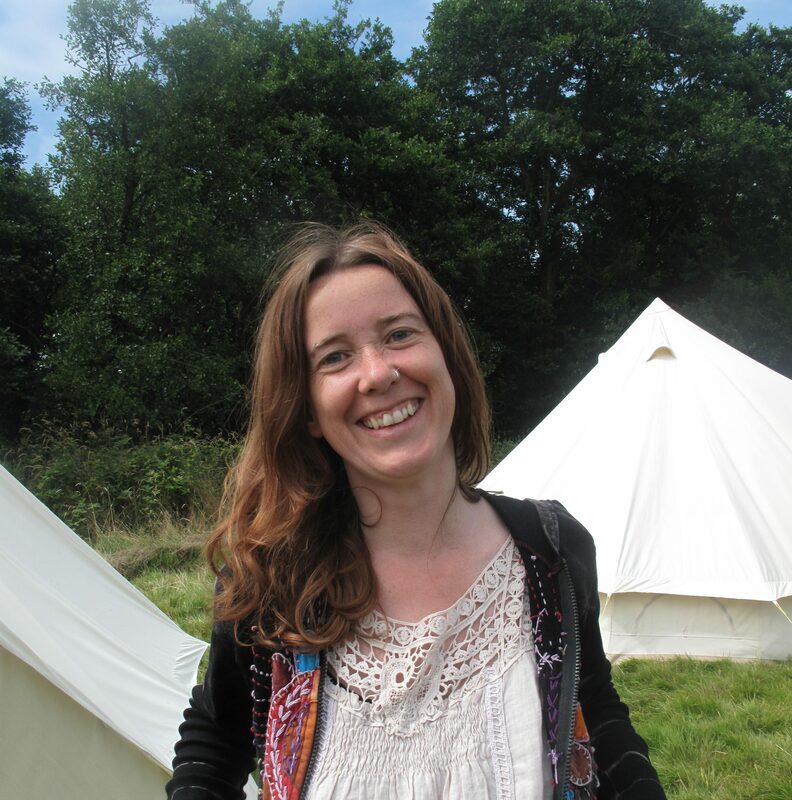 Moksatara, from Sheffield, said, “The simplicity and freshness of being outdoors and camping was so revitalising and grounding, and very much informed the meditative states and quality of awareness that I was looking to tune into. Total Immersion runs from Saturday 6 May-Friday 2 June, with the option to attend 6th-19th May. Book here. New to meditation? 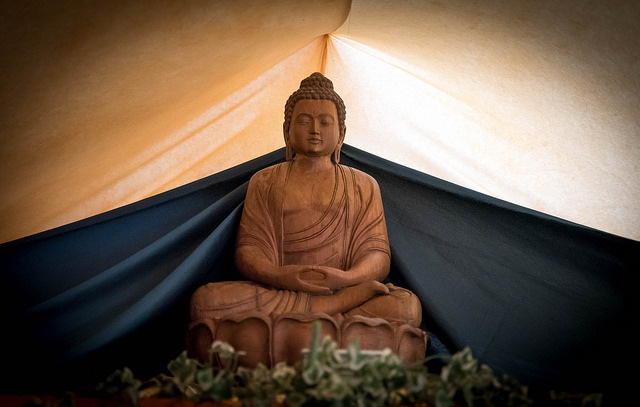 Find other Buddhafield retreats and events here.